The people of Israel are to be the holy people of a holy God. are also called to holiness. But what does it mean to be holy? Many people associate holiness with holy objects. something or someone becomes holy. An altar is holy. The bread and wine of communion are holy. Many of you grew up with holy water. Perhaps we are supposed to be like that. Special. Almost glowing with an ineffable, intangible light. Or perhaps holiness is the unearthly power of God. when the Nazis open the Ark and a beautiful angel comes out? Suddenly the angel transforms into the angel of death. and the Nazis’ heads explode. I don’t have the power to make people’s heads explode. Maybe I’m not holy enough yet. Or perhaps holiness is equated with a moral purity. for they are constantly occupied with thoughts of God. that it is impossible to measure up to their standard. Others associate holiness with an aloofness from the world. of you or the way the world is. and your life pales in comparison. because they don’t listen and are always ready to tell you what they think. that they can actually turn people off from God. should be the mark of a holy people of God? is to be set apart in some way. But how is one set apart for God’s purposes? then what does it mean to be holy? by coming to his creation with his whole being. The holy God is not of this world, and stands apart from the world. in the Incarnation, in the Crucifixion, and the Resurrection. of God’s otherness but also God’s being-for-us. Every fall we celebrate Holy Cross Day. becomes a symbol participating in God’s loving embrace of humanity. means participation in that love. and then to be sent back toward the world as a sign of God’s love. but neither is a rejection of others. precisely for the sake of the one who calls them to live for him alone. because the call to holiness is the call to love. and it includes what one must do for one’s neighbor. unless God’s love in Christ is defined as a special power. it gets its hands dirty and serves other people. This is where our Gospel lesson comes in. Is it right to love those who hate you? and this can certainly happen. to the time-honored attitude of hatred. 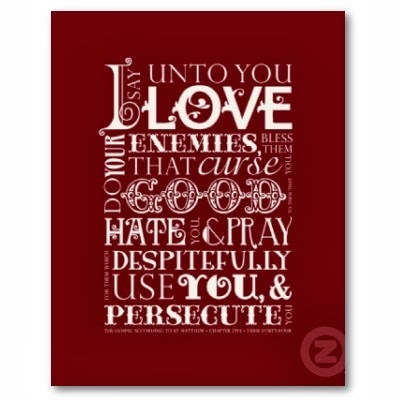 Instead love for enemies must be a response to the character of God. even when they do not care for him. for those who repent and those who do not repent alike. steamroller them in World War II. even those who write and say things critical of our faith. Is it easy to love people such as these? No, and not every situation requires the same response. back in a position of vulnerability in order to pray for that person. in order to love that person. but instead in freedom seeks to meet us. Love for others involves both attitude and action. for we are alike in so many ways. all human beings are within the reach of Christ’s saving love. and to in some way suffer their abuses. To love one’s enemies is indeed an inhuman possibility. It is inhuman in the sense that it does not come naturally to us. that we are able to begin to love our enemies. And we can make a beginning, every day. and therefore one to whom we may reach out in love as well.